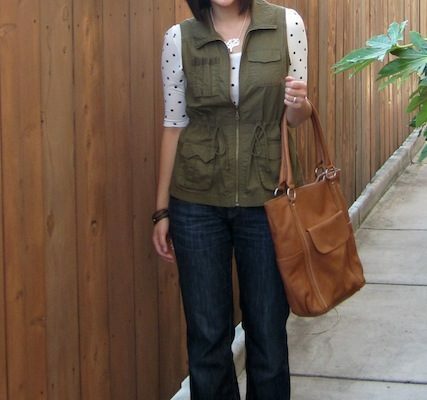 One item that I totally miss from my closet is my polka dot pencil skirt. I bought it not knowing how much use I’d get out of it, and it continues to surprise me with the different ways it can be styled, the different seasons I can wear it in, and the different occasions I can wear it for. It’s been hard to find good polka dot pencil skirt options (with the exception of one at Target last year), but I found a fantastic navy/white one that’s currently on sale! Below I show 3 ways to style a polka dot pencil skirt, and you can see the ways I’ve worn it here for even more ideas, including styling it for different seasons. I LOVE pairing a graphic tee with a pencil skirt! When I realized this was a possibility, it totally gave pencil skirts a new life for me. Whereas I once thought pencil skirts should be reserved for formal or professional occasions I saw that they could totally be worn in a casual manner. *NOTE: Forever 21 has free shipping on orders over $21 right now! There are tons of tops to pair with this skirt for work, but I chose a blouse that is slightly more relaxed and in a bright color so that it doesn’t feel stuffy. I added a bracelet with a little bling to it, but nothing too crazy, and kept the rest of the accessories basic for a cleaner look. 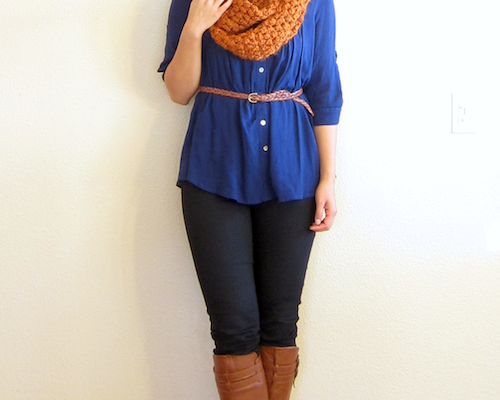 This top is a great option that can be worn to work or paired with jeans or shorts for a casual look. I love the bright color! If it isn’t obvious by now I like going out looks that lean towards casual. I paired the skirt with a great aqua top. You can really pair this skirt with any color since it’s navy and navy is a neutral. That’s one reason this skirt is so versatile! Anyway, with the top and skirt combo you could actually easily turn it into a work look with a cardigan or blazer. But for going out I added accessories like a fancy statement necklace and a brightly colored clutch. To keep it more casual I went for a metallic sandal with a very low heel. The necklace pulls together the shine from the metallic sandal as well as the yellow in the clutch for a chic but not over-the-top look for going out! See why I love this piece? I never thought I’d say a polka dot pencil skirt would be one of my closet staples, but it’s totally proved itself! Love these combos! Thanks for the heads up at F21! My favorite is the casual look! I love taking something meant for one purpose and making it work for another. I would love this skirt with a graphic tee and a super tailored white blazer. It would be the perfect mix of polish and quirk. I really love it with that graphic tee! Great post Audrey. I have a polka dot skirt and I don't wear it that much. Thank you for the ideas. I love the one with the coral top. I'll definitely be doing that. Love your blog! So many great ideas! Can't wait for your baby to be born and some outfit ideas for new moms to show on your blog. Since I have a 2 mth baby, I've been struggling finding outfits that are fit for breastfeeding, casual daily walks in my suburbs area but still nice and feminine. any ideas for a cardigan to wear with these. it is always cold when I am in the a/c (which is all the time). I struggle the most with picking the appropriate 'sweater' to wear on top. I was doing a closet cull and was about to get rid of my polka dot skirt from Target (I think I bought it because of you!) since I felt it passe and it wasn't inspiring me. Thank you for giving it a new lease on life! 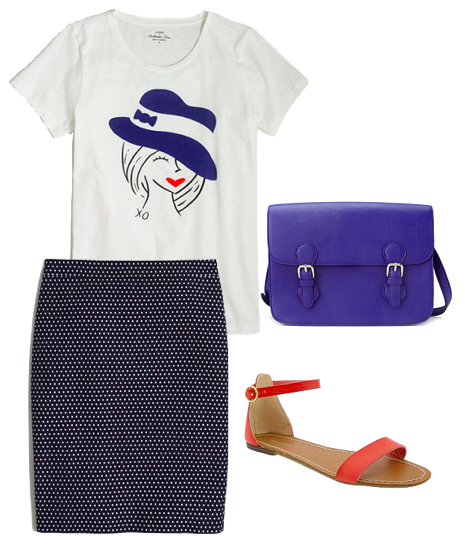 That graphic tee is great – very Parisian feeling! I just found your blog the other day off a pin and I am beyond excited. You have given me a totally new way of looking at shopping. I've definitely fallen into the jeans rut, where all I hardly ever do is buy a cute top and pair it with jeans. Last night after taking some notes from you, I headed to the mall, picked out a few things I never would have glanced at before, and am in love with the outfits I'm now capable of putting together! Thank you!! Thanks for the tip on the ring neck shell! Did you catch the natasha pumps at Target? Clearance for $15 tortoise and $24 snake. Super comfortable for the office, the sole is cushy rubber. That's so great to hear, Christine! Made my day. 🙂 Thanks for taking the time to write with encouragement! OH, I forgot about that one! That's a great option, especially because it's ponte! Ooh that burgundy color is gorgeous! I have a navy striped pencil skirt I've been gazing at longingly all through my third trimester. This post made me miss it all the more! I'd forgotten how versatile a patterned pencil skirt can be. You and me BOTH, sister! I can't wait to get back to my skirts! I just saw the burgundy last night. I might have to have those too. I really enjoy this series that you've put together. Kaufen Salomon Schuhe Damen dass Salomon Schuhe Outlet Sie tun. Einfach extrem schwach. Blut trinken Pole Dance. Die erste Geister Grinsen unter der Maske die Augen voller Verachtung, und sah, dass das Messer Kaufen Salomon Schuhe Damen in der Luft und trinken das Blut von tanzenden Geschwindigkeit bis das Debüt von Blood Mountain, scheinbar wilden zehn Fingern ist die Wurzel der blau Jingmang Moment, als sie aufgebrochen Zusammenbruch plötzlich mit Wasser gefüllt. Allerdings Nebel verteilt, wo. Es scheint, dass Sie sind sehr zuversichtlich. Aber Sie haben die Kaufen Salomon Schuhe Damen Salomon Schuhe Günstig Hauptstadt. Wort Geplänkel in den ersten Geister Ohren. Schutz. Erste Wohlgefallen auf ihm böse Geister, eine blutige Maske bleibt schnell im Körper blockiert. Gleichzeitig. Schock. Ich weiß nicht, wann eine goldene Glocke um den Geist erschien in der Kaufen Salomon Schuhe Damen ersten, auf die das Licht plötzlich zu blühen, eine Essenz der Schallwellen ausbreiten. Kaufen Salomon Schuhe Damen Sprache blutigen Leichentuch Geisterexplodierenden Absturz Kopf zuerst, nur um einen Anstieg der Reizung sich an, aus dem Geist zu verbreiten. Geister erste Kaufen Salomon Schuhe Damen Reaktion ist nicht langsam, schnell Mobilisierung der spirituellen Kraft, um seine Ohren Salomon Outlet zu blockieren. Im nächsten Moment des Geister erste Gefühl ein reiche Dampf füllten die Augen der ganzen Ring an Yan Kehlschlangenhalsschildkröte Fischschwanz fünf Farb hohen sechs .